If you're a fan of green tea, you'll enjoy this recipe for nokcha, or green tea, cake. This simple, moist cake is subtly sweet, so it may be an appropriate treat for someone with diabetes or another health condition in which blood sugar must be managed. Of course, if there's no medical reason for you not to indulge your sweet tooth, you can adjust the amount of sugar in this recipe to make a sweeter cake. You can also top your green tea cake with a delicious cream cheese frosting. 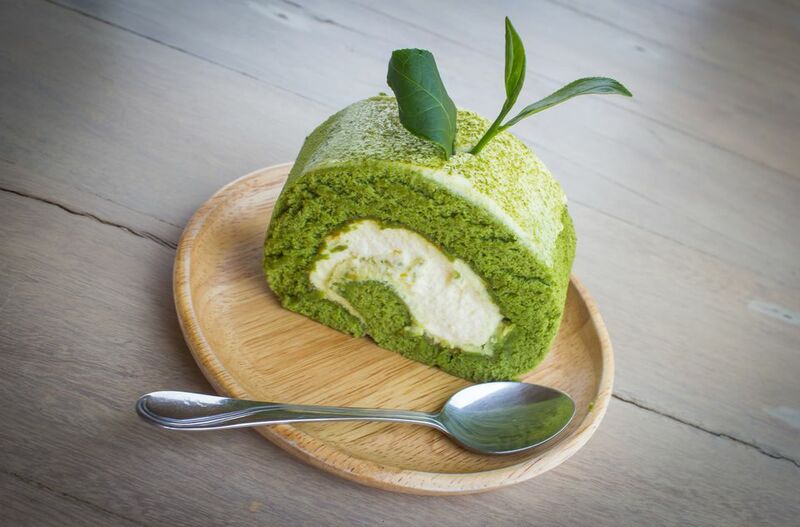 You need natural green tea powder to make this cake, which you should be able to find in most Asian grocery stores or from specialty retailers online. The Korean label will likely say: “Nokcha Karu,” while the Japanese brands will say “Matcha.” If there's no Asian market in your area and you prefer to shop in person rather than online, you can make a visit to a tea retailer to find Matcha powder. This kind of tea has developed a huge following in the West, thanks to public figures, such as Dr. Oz, touting its benefits on television. Be aware that green tea has caffeine in it, so if there's any reason for you to avoid the stimulant, take caution. To begin making the cake, turn the oven on and preheat it to 350 F.
Then, in a mixing bowl, beat eggs, sugar, vanilla, and oil together until the resulting mixture is fluffy and light. Gently stir Greek yogurt into the mixture. This yogurt has a range of health benefits, including high protein content and probiotics which are great for balancing gut bacteria. Choose the organic variety if it's available and in your budget range. After stirring in the yogurt, get a separate bowl, and then sift the flour, baking powder, and green tea powder together. Next, gently fold the flour mixture into the wet sugar-yogurt mixture. Then, pour the resulting cake batter into a greased cake pan, smoothing out the top until level. Bake the cake for 35 minutes or until the top becomes golden brown and a toothpick comes out clean from the middle. If there's batter on the pick, keep the cake in the oven for a few more minutes, checking periodically until it's done. If you're using cream cheese frosting instead of sugar, wait for the cake to cool down before icing it. *If you can't find superfine sugar, learn to do-it-yourself. ** NOTE: If you don't have cake flour and need to substitute all-purpose flour in this recipe, then you need to use LESS all-purpose flour. Use 1.5 cups minus 3 tablespoons of all-purpose flour. Green tea is a staple of the Eastern diet, but as Westerners begin to take an interest in all things from the Orient, the tea has garnered a following abroad. In fact, green tea has been used in hundreds of Western clinical studies in recent years, and the research has been overwhelmingly positive. It has found that green tea can potentially fight cancer, heart disease, high cholesterol, diabetes, and dementia. It may even counteract the effects of reproductive health problems, such as fibroids and endometriosis. And if you're watching your waistline, studies have found that green tea has belly-blasting properties. So, what's so magical about green tea? The unfermented leaves of green tea contain antioxidants known as polyphenols, which fight the free radicals that damage cells in the body and lead to disease. Polyphenols contain six major catechin compounds, most famously EGCG, which has been the subject of much research. EGCG is even sold as a supplement.